Jet Pet Resort and Spa is exactly what the name implies; a resort and spa indeed! A specialized dog and cat care facility that caters to every one of their needs. Boarding, daycare, spa, whatever your dog or cat desires. Their wish is our command. It can be quite exciting to get yourself ready for a vacation, and it can get overwhelming as a cat or dog owner also getting them ready for their vacation at Jet Pet Resort and Spa. We have put together some frequently asked questions to help you cover your bases and get your dog or cat ready for their luxurious vacation with us. How far should you book ahead? While we do our best to accommodate last-minute bookings, it would be best to book at least 1 week ahead for stays during regular weekdays and weekends; at least 1 month ahead for stays during peak seasons (long weekends and holidays); and at least 2 months ahead for stays during the premium peak season over December and early January. The earlier the better to guarantee your pet has a spot AND is staying in the suite type of your choice. Speaking of suites, what is the appeal of Jet Pet Resort’s luxury suite? Even though the Classic Suite is a cozy, comfortable option, the Luxury Suite is something special to behold. Aside from it being the size of 3 classic suites put together, the luxury suites have human sized beds (perfect for dogs and cats used to cuddling up with their humans at night!). The suites also have camera access so, using our mobile or desktop app, you can login and see what your pet(s) are up to while they eat and dream away. Let’s not leave out the fact they have their own LCD TV looping pet-friendly movies that provide a soothing level of background noise – all the comforts of home. What kind of accommodation best suits which kind of cat? Our feline guests have the option to stay in our cat lounge or in a private suite. The cat lounge is an open concept space for well-socialized cats to min gle, rub noses, or simply keep watch of what their neighbours are up to. They have their own personal cage to eat and sleep in peace overnight, but during the day they’re free to explore! Cats used to living with other pets, or have experience roaming the outdoors without causing havoc, would likely do well in our cat lounge. 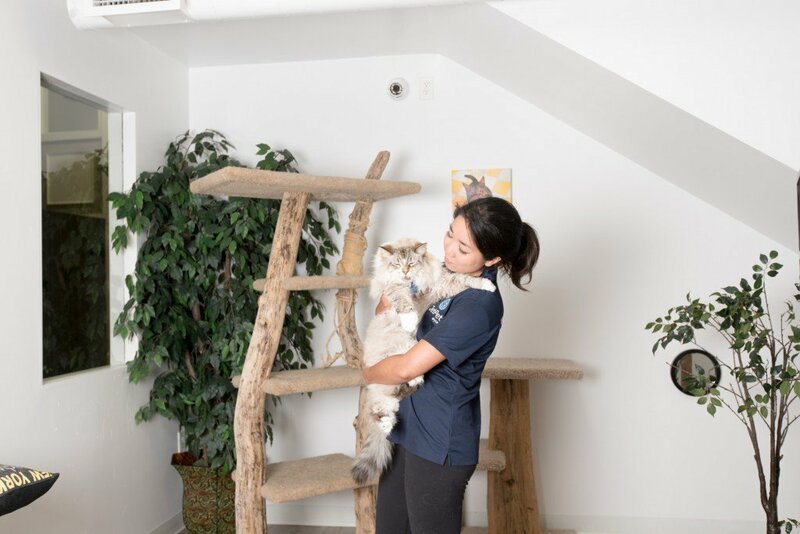 An anxious or indoor-only cat having never met another animal before would do better in a private suite where they can be alone with their thoughts and enjoy tummy rubs from the staff. What should you pack for your pet’s vacation? The bare minimum is food! Enough of your pet’s food to last the duration of their stay and a little extra just in case. We happily provide everything else: toys, bedding, food bowls and water dishes (and also for cats: plenty of cat litter and scratching posts!). You are of course more than welcome to provide your pet’s own favorite bedding, blankets and toys – whatever you feel helps make their bedroom feel like home. Monday-Friday 8am to 6pm and Saturday-Sunday 9am to 5pm. You can also feel free send an email with your questions to hello@jetpetresort.com.